A comfortable riding saddle - minus the horse. They were closer now and it seemed to him that they were sitting in invisible chairs that traveled very fast. He saw that they were humanoid, to a degree at least, and there were only three of them. They came in with a rush and stopped very suddenly a hundred feet or so from where he sat upon the steps. He didn't move or say a word -- there was nothing he could say. It was too ridiculous. They were, perhaps, a little smaller than himself, and black as the ace of spades, and they wore skin-tight shorts and vests that were somewhat oversize and both the shorts and vests were the blue of April skies. But that was not the worst of it. They sat on saddles, with horns in front and stirrups and a sort of bedroll tied on the back, but they had no horses. 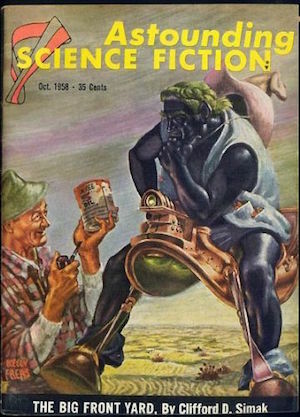 The saddles floated in the air, with stirrups about three feet above the ground and the aliens sat easily in the saddles and stared at him and he stared back at them. Finally he got up and moved forward a step or two and when he did that the three swung from the saddles and moved forward, too, while the saddles hung there in the air, exactly as they'd left them. From The Big Front Yard, by Clifford Simak.